In May 2016, Slovenia decided to use a very restrictive approach to multicopters. Flights are only allowed for leisure activities in uninhabited areas. The following activities are explicitly prohibited: aerial photographs, flight maneuvers for firefighting, scientifically motivated copter missions, competitions or journalistic operations. Unfortunately, the current settings are very backward. However, the regulations have only been issued temporarily by the national air traffic authority until legislators agree on new laws. In the future, the situation can ease considerably. Maximum flight altitude: In Slovenia, you are not allowed to fly higher than 150 meters with your copter for private purposes. Maximum horizontal distance and FPV: The maximum horizontal distance must not exceed 500 meters. FPV flights are permitted if a second person keeps an eye on the copter and is in the immediate vicinity of the pilot. Compulsory insurance: As far as I know, an insurance obligation for unmanned flight models does not exist. Nevertheless, I recommend the conclusion of a corresponding policy. Maximum take-off weight (MTOW): From a take-off weight of 5 kilograms, you have to register your drone by 24 hours at the latest before the flight control. Distance to airports: Without appointment your flight, you have to keep a distance of at least 1.5 kilometers from airports. Other safe distances: As you are generally only allowed to fly in uninhabited areas, no further safety distances are defined. Time of operations: Drones may only be flown in daylight. Regulations for commercial pilots: Commercial drone uses are not allowed in Slovenia. 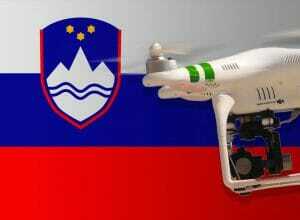 We have researched the listed drone regulations for Slovenia to the best of our knowledge. We can not guarantee the correctness of the information. If you want to be on the safe side, please contact the competent aviation authority. Alternatively, you can also ask the embassy in your country for further information about the regulations. Please leave us a comment when you receive news and/or gain experience with your copter in Slovenia! Hey Francis, as an amateur travelling to Slovenia, what if I were to bring a dji spark to fly in uninhabited areas? Could I not take any video with this? The rules are clear on that point. You are not allowed to fly a drone for photography in Slovenia. Hi Francis, just following up. What is classified as an aerial photograph? any sort of imaging device or aerial photography for commerical use such as orthoimagery or image mosaics. actually you are free to fly your Spark as it is under 500g. You are not allowed to do any “activity” with it. That includes photgraphy of any kind. If you want to do that you have register with CAA. and state that you know legislation. and pay 80 eur tax. Him do you know any form where should I apply if I would like to register with CAA in Slovenia? Flying drones is new for me and I searched for over an hour to find the exact rules for drone use in Slovenia. 1. Is bringing my drone by hand luggage cause any problems? 2. If question 1 is no problem, can you fly your drone in Slovenia by using common sense? Aiming for three 10 minutes flights max. (Bled, Predjama castle and Ljubljana. Ljubljana ofcourse not the inner city but outside it). It would be really great if someone can inform be about it. Thanks a lot! For flying heavier drone than 500g it has to be registred and flight reported to CAA. See regulations in english. when flying 4 prop drone you have to stay 30m away from objects, people, infrastructure. That is on short. so i guess I can fly dji spark at slovenia right? Thanks Maj! This is helpfull. My drone weights 1kg (Karma). If I don’t register, will this give me problems at the airport? And do you know anything about the fine for flying without a permit? My idea is to do a really short flight to shoot some nice footage and that’s it. The paperwork and 80 euro tax isn’t really motivating for me. Would not know about airport. I suppose owning a drone is legal anyhow. Rules are just for flying. Fines are genaraly in 200 to 2000 euros range. For person. And for company as well. I guess you would be breaking more than just one paragraph. Probably multiplying a fine.